Stainless steel flat washers are extremely corrosion resistant making them ideal for outdoor use. They are a durable spacer, providing the smooth bearing surface needed to distribute the fastener load over a wide surface area. KD Fasteners, Inc. offers flat washers in the 300 stainless steel series and 316 stainless steel. Whatever stainless steel flat washer you’re looking for, if we don’t have it on our shelf, we can quickly get it for you. Our washer capabilities range from small (under 100 pieces) to large runs. We will custom make your stainless steel flat washers to your exact specifications. Contact us today by calling 1-800-736-5014 or filling out our contact form. 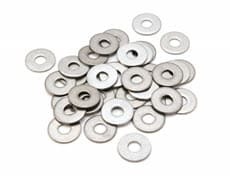 We carry a large selection of flat washers in 300 series stainless steel. Our off the shelf items include commercial flat washers, MS flat washers, AN960C, and fender washers. KD Fasteners carries 316 stainless steel flat washers. 316 and 316L stainless steel are a molybdenum-bearing austenitic stainless steel.